The EUROCOM P5 Pro can now support four simultaneous displays with AMD Radeon R9-M290X MXM 3.0b graphics, socket based Intel Core i7-5775C unlocked and overclock-able Broadwell processors. The AMD Radeon R9 M290X is a 28nm DirectX 11 graphics card based on the GCN (Graphics Core Next) architecture with 1280 1D shader cores and 80 texture units, core clock only 900 MHz (boost). Other Features of the M290X include the new UVD3 video decoder for decoding MPEG-4 AVC/H.264, VC-1, MPEG-2, Flash, Multi-View Codec (MVC) and MPEG-4 part 2 (DivX, xVid) HD videos directly from the AMD GPU. PowerTune allows automatic overclocking and underclocking of the graphics card as long as the GPU is within its TDP range. Intel’s Core i7-5775C is a socketed desktop processor with Intel’s most advanced on-die graphics engine, Iris Pro Graphics 6200, it is compatible with the LGA 1150 interface, and they’re also multiplier-unlocked, allowing users the ability of overclocking it for additional performance. 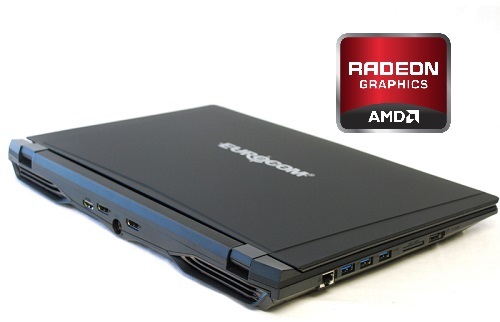 The EUROCOM P5 Pro will support both Haswell and Broadwell Processors. The EUROCOM P5 and P7 Pro laptops offer serious CPU socket scalability and upgradeability with support for 4th and 5th generation processors in the form of Intel Core i5, i7, i7 Extreme and Xeon processors. Being fully upgradeable and configurable, customers can now come to Eurocom for a variety of Enthusiast and Professional processors. Eurocom provides an optional unlocked BIOS to allow customers to take full advantage of overclocking capabilities within unlocked Intel processors. These 14nm Intel Broadwell CPUs advance power efficiency over previous offerings by specifying 65W TDPs for unlocked quad-core models (QC). The 15.6” EUROCOM P5 Pro supports a variety of crystal clear, high pixel density displays from 1920x1080 FHD, to 3840x2160 4K displays to allow customers to choose the exact display for their projects, combined with the pixel pushing power of the AMD Radeon R9 M290X GPU. The P5 Pro is prewired for 3G/4G module support, through an M.2 slot, so users can have a reliable internet connection on the go. Storage comes by way of four drive bays, two M.2. SSD slots and 2 standard drive bays for up to 5.2 TB of RAIDable storage. PCIe Solid State drives are supported for enhanced storage performance. RAID 0,1,5 and 10 are offered for maximum performance or redundancy. An 8 cells 82Wh Li-Ion internal battery pack is supported concept, offering up to 120 minutes of backup battery power in case of electricity failure, allowing for safe and secure shutdown after power loss.